A collection of essays confronting the past, present, and future of literary culture. 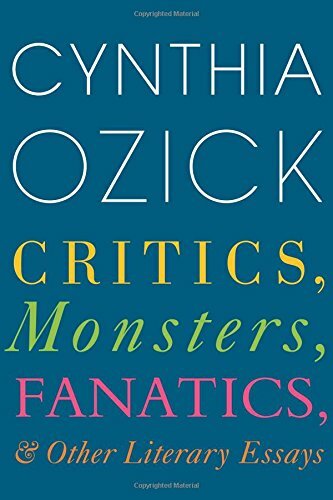 [Ozick's] is a criticism of nourishing potency that finds equal footing with the literature it seeks to augment. Reading her you understand immediately how criticism can itself soar with art, and how the critical essay well done is its own best argument for being ... A sorceress of silken prose, wholly incapable of platitude, of cliché, of even the stray dead phrase, Ozick can make anything happen with a sentence, proving that the valence of sensibility must manifest in style. One’s faith in Ozick’s 'large project' depends mainly on how willing one is to join her in grandly ignoring the exigencies of the marketplace. The literary novel may be an independent art, but long-form, highbrow criticism is surely rather less so: The amount of such writing that is being published at any given time relates less to necessity and will than to the number of readers prepared to pay for it. And much as we might wish it were otherwise, it’s safe to say that the current supply of superior criticism is more or less commensurate with public demand. More troubling than Ozick’s indifference to these bothersome facts is the aggressive snootiness of her tone...there is something unseemly and excessive about the energy she expends on delineating what she finds vulgar and unsatisfactory in the current literary scene ... She is a subtle reader and persuasive champion of the aristocrats of her cultural hierarchy. The essays in this collection that discuss the work of Bellow, Kafka, Trilling, Malamud, are all shrewd and engrossing and eminently capable of seducing the reader’s agreement. But her zealous efforts to put lesser talents and lower forms in their place are rarely so edifying. [Critics, Monsters, Fanatics] is bristling with energy, pulsing with electricity, vibrantly alive ... both a testament to her inimitable brilliance and a clarion call for the indispensability of the critical enterprise ... Reading her, we watch a mind stroll about, hungry, fearless, supple, in unrelenting search of truth, beauty, meaning ... Throughout, Ozick emphasizes how once towering figures in the literary firmament have been reduced to minor deities or cast out of the heavens altogether; others hover on the brink of oblivion. What did you think of Critics, Monsters, Fanatics, and Other Literary Essays?